IF YOU gaze long enough into the void, the void might begin to speak to you. Giant regions of near-empty space known as cosmic voids could help us get a handle on dark energy, the mysterious stuff that is speeding up the expansion of the universe. If gravity were the dominant force at work, the expansion would be slowing down, as matter gives in to the pull of other matter. But more than a decade ago, supernovae studies revealed that the expansion is speeding up. This suggests the vacuum of space-time must have an inherent energy that is repulsing gravity. 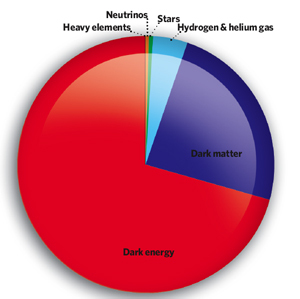 Dark energy is thought to make up about 70 per cent of the universe, and several ideas are competing to dark energy density can change with time. One way to test these ideas is to measure the expansion rate over time, which should leave a mark on cosmic voids. Quantum fluctuations in the early universe led to variations in the density of primordial matter. Galaxies and clusters formed in denser regions while voids emerged between them, creating the large-scale structure of the universe seen in galaxy surveys like the Sloan Digital Sky Survey (SDSS). Voids are typically up to 150 million light years across. The expansion of the universe has stretched the nearly spherical voids into egg-shaped bubbles. "Voids are highly sensitive to dark energy," says Rien van de Weygaert of the University of Groningen in the Netherlands. Comparing the shapes of voids of different ages can reveal changes in dark energy density, helping to distinguish between theories, according to simulations run by van de Weygaert's team (arxiv.org/abs/1211.3249). However the effect is subtle, and the shape of a void is also affected by the motions of galaxies caused by strong gravitational interactions. So Guilhem Lavaux of the University of Waterloo in Ontario and colleagues proposed a solution: take the shapes of all voids of a given size and stack them to derive an average amount of stretching. The team has already applied this technique to voids in the latest SDSS data (arxiv.org/abs/1208.1058). But imprecise galaxy distance measurements make the void boundaries hazy. The survey also does not see deep enough into space - and so far enough back in time - to provide the full history of how voids have evolved, says Lavaux. That could change when the Square Kilometre Array (SKA) radio telescope comes online. By 2024, it should be finding billions of galaxies across the universe. "To nail it, you'd need this next generation of telescopes like the SKA," says van de Weygaert.